Greening Nipissing News Release ***** Residents who want to save money, care for their gardens, and protect the environment know that rain barrels help meet all three goals. Residents who want to save money, care for their gardens, and protect the environment know that rain barrels help meet all three goals. Greening Nipissing, in partnership with Knox Callander United Church, is now accepting pre-sale orders as part of their truckload Rain Barrel sale on Saturday, May 24th. Rain barrels are $70 each and orders must be placed in advance of the sale, either online at www.RainBarrel.ca/northbay, by emailing info@greeningnipissing.org , or by calling 705-472-0200, ext. 2. Barrels can be picked up at either 1350 Fisher Street, North Bay between 11 a.m. and 2 p.m or 280 Landsdowne Street, Callander, ON between 9 a.m. and noon. Greening Nipissing envisions a greener North Bay and area by providing a practical and economical approach to a cleaner environment. In the past, Greening Nipissing has installed a public bicycle fixing station, promoted community gardens, and transformed urban paved areas into green spaces. Proceeds from the sale will continue this work as they educate, promote, and encourage environmentally-friendly practices in the region. Knox Callander United Church is a Christian faith community that has served the village of Callander and surrounding area for more than 100 years. Consistent with the United Church of Canada belief in taking care of the Earth God has provided us, partnering with Greening Nipissing on a rain barrel sale is a natural fit. Funds raised from this initiative will support the church’s community outreach efforts. Rain barrels capture and store chlorine-free and fluoride-free rain water from a home’s downspouts, making it ideal for flowers, vegetables, lawns, shrubs, and trees. Collected water can also be used to wash cars, clean floors, and even do laundry! These many uses can provide water conservation opportunities, particularly during the dry summer months. They can also provide cost savings to every resident, especially those who pay to have water trucked in, use a well, or have a water meter installed – which, for North Bay residents, will be a reality by 2015. When ordering in advance of the sale, purchasers select the colour and model of their rain barrel, and add any accessories, such as downspout diverters and rain barrel stands. Each barrel is equipped with all the parts needed to put it together, so it can be collecting water in no time at all. Also new this year for Greening Nipissing customers are composters and kitchen compost carriers! These environmentally friendly products were once used to transport fruits and vegetables, but now they have been repurposed and offer years of reliable service as rain barrels. Purchasing one not only saves residents money and helps the environment, but, with this rain barrel sale, it also supports local environmental champions. 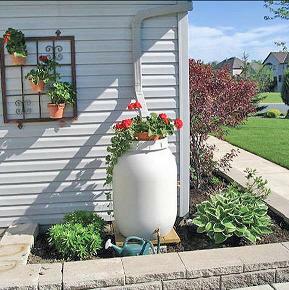 Rain barrels are gaining popularity in North Bay, so now is the perfect time to keep up with the Joneses! Greening Nipissing is a not-for-profit, registered charity and environmental organization based in North Bay. They identify environmental health issues and priorities and, in partnership with other organizations, provide practical skills and knowledge to develop positive attitudes toward the environment.